No tour of Southeast Asia is ever complete without spending a few days in a Bangkok city hotel, in Thailand’s capital and largest city. In fact, most travellers eschew other countries altogether. Often, Bangkok is enough to satisfy one’s wanderlust and search for something exotic, as it is here that you would get a generous helping of both. Strewn with glistening temples and noisy ‘tuktuks’, scented with aromas wafting from temples and food stalls on the streets and frangipanis in bloom, accented by the saffron robes of Buddhist monks, and blessed with a tropical climate, Bangkok is an overload of multi-sensory experience unlike anywhere else in Southeast Asia. Being the most popular destination in Southeast Asia means that there is an abundance of hotels and apartments in Bangkok that cater to all types of travellers, although you will have to fight with 20 million other tourists to get the best Bangkok hotel deals. It’s easy to get overwhelmed in this Asian capital; after all, Thailand’s capital in the native language, which starts with Krung Thep Maha Nakhon, is on the Guinness Book of World Records as the longest place name in the world. Despite the throng, finding a place where to stay in Bangkok comes easy; cheap hotels in Bangkok are plentiful along Khao San Road. During off-season, you can even find hostels in Bangkok for less than $10 a day, or $5 if you can rough it in a shoebox mattress. As the confluence of backpackers of all stripes, Khao San Road is one of the most electric nightlife hotspots in Bangkok and street food haven. Expatriate enclave Sukhumvit road is lined with luxury hotels in Bangkok and peppered with hedonistic destinations at night. But if you want to get into the thick of nightlife action where garish neon lights rule, Patpong’s go-go bars may be for you. For a British take on pub crawl, head to the more mellow Soi 4. Bangkok is its most dramatic and picture-perfect where Wat Arun – the Temple of Dawn – rises majestically and all aglitter on the banks of the mighty Chao Phraya River. But Wat Arun is just one of the thousands of Buddhist ‘wats’ or temples that dot Thailand that it’s easy to get caught up in temple fatigue if you don’t pace yourself. But if you were pushed for time, you would not want to miss the ornate and gilded Wat Phra Kaew or the Temple of the Emerald Buddha where an icon of Buddha carved from a single jade stone has been in residence since the city came into existence in late 18th century. 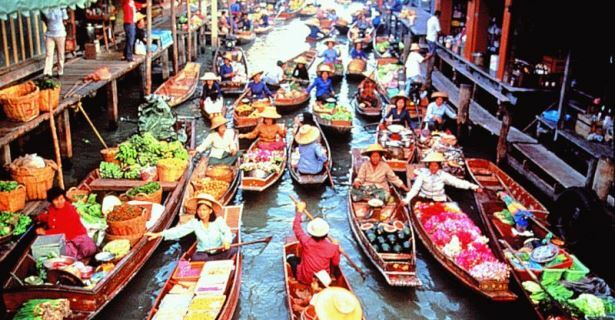 Across the bank is the brisk but relatively quieter district of Thonburi where you can buy fruits and vegetables and other wares in Bangkok’s famous floating markets. While this district is not centrally located, some of the best hotels in Bangkok can be found here. Guests of 5 star hotels in Bangkok are usually ferried downtown just a few minutes away. Ease your temple fatigue by getting the world-famous Thai massage right in the grounds of Wat Po, home of the Reclining Buddha. Then treat yourself to a sumptuous meal fit for a king in Dusit, Thailand’s administrative center and home to the ruling monarch.